Spoon Lake Cabin is situated in a very private setting on a secluded lake bordering the western boundary of Glacier National Park. There are only a few cabins on one side of the lake offering views of the lake and national forest and mountains across the lake on the other side. Constructed of rustic logs, the cabin sits on Spoon Lake, with 4 1/2 acres of privacy. The floor plan is spacious with a large living room, kitchen and dining on the main floor that open onto a large deck facing the lake and covered porch on the other side. The deck is set up with a picnic table and barbeque and stone fireplace/woodstove inside. There is one bedroom with a queen bed on the main floor, as well as a bathroom and laundry with washer and dryer. The loft has a second bedroom with 1/2 bath and bunkroom with double, single and bunkbed. The cabin is well stocked with games, books, foosball table, antique player piano and radio, as well as large maps of Glacier National Park, lakes and trails. The location is very peaceful and feels quite remote, yet is only 7 miles from the conveniences of town (Columbia Falls) and only a 15 minute drive to West Glacier, the west entrance to Glacier National Park. Access to the North Fork River is just 2 miles away. We leave our canoe, so our guests can experience all the wildlife and beauty of the lake. It is a great place, in a beautiful setting. We love to share it with our guests. 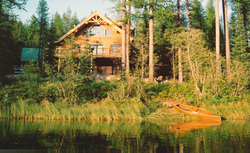 Directions: Spoon Lake Cabin is at the western boundary of Glacier National Park; 7 miles north of Columbia Falls; 15 minute drive to Glacier National Park; 25 minutes to Glacier International Airport; 5 hour drive from Spokane, Wa and a 10 minute drive to river access on the North Fork River.